Here’s a ‘new’ electrolytic: the brown Teapo in front of the plug. I put new in quotes because if you look closely you will see a manufacture date of 12/97. Good times! I think I’ll buy my capacitors from the evil catalogs in the future to make sure they’re fresh. So this is about how it goes replacing a capacitor. 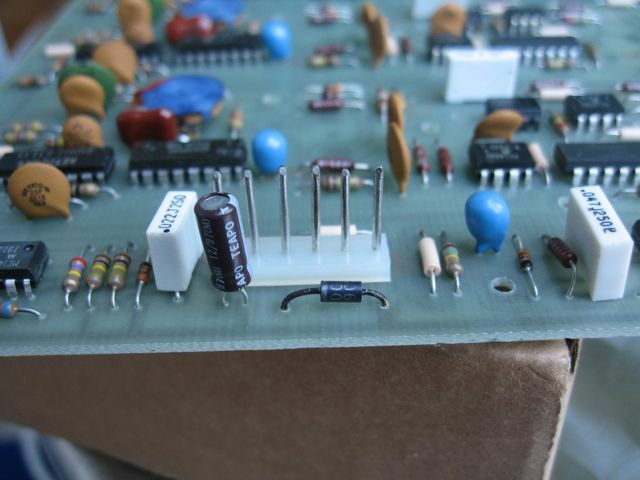 First you remove the solder holding the old capacitor to the board with wick or a pump or whatever you choose. If you’re like me you probably use the wick -use the finest, thinnest type you can find. Next, once you’ve removed the solder, use fine needle nose pliers or tweezers to break the leg of the capacitor loose from the side of the hole it’s in. Then you bend the legs of the capacitor straight so they will come out of the board easily and pull it out. Removing all the solder seems to be the hardest part. Occasionally you’ll have to do the old ‘heat the leads and pull’ trick, but they will come out eventually so be patient. Soldering the new one in is easy. Pull the leads through -the long one is the positive -the one with the stripe is negative. You want to solder the new one in as quickly as possible -heating it as little as possible while making sure the solder is well connected to the traces on both sides if needed. You might have seen this before. If you look closely you can see the solder under the new ones doesn’t penetrate the traces very well. I went back and added a bit more solder so it is fully connected. I don’t have a picture of it done that I can find but It now looks pretty good with its keys all healthy. Miraculously I plugged it in, turned it on and it worked straight away. No drama. I’ll post some recordings with it before long. 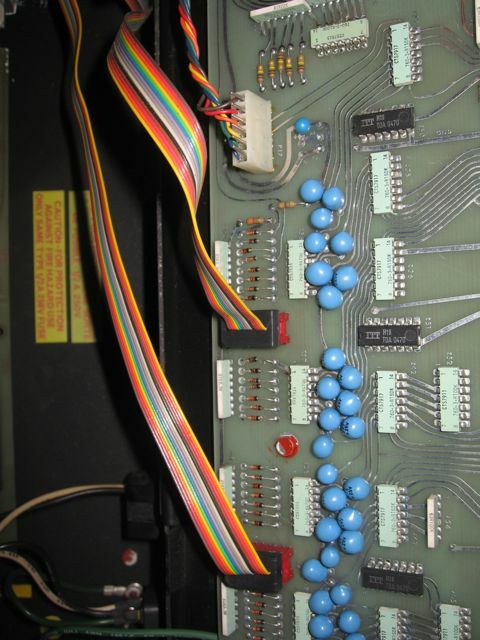 This entry was posted in Arp, Omni/Omni2 and tagged Arp Omni, synthesizer repair by Hamilton. Bookmark the permalink.